Carrying on from yesterday's nostalgia about the first space marine off the production line in 1997 when Citadel Miniatures moved to the present site in Nottingham, today I wanted to show this cabinet snapped at Warhammer World. It is one of the first cabinets in the display and features a veritable feast of older merchandise from the early days of Citadel, Warhammer and Games Workshop. I'm not too embarrassed to tell you that I owned (and still own in a few cases) a number of these items. I'm particularly pleased I held on to my original Realms of Chaos books (although they're very battered / well-loved now and not worth anything in an auction I'd bet). "The original Warhammer 40,000 Space Marine celebrates his birthday soon. What are you getting him? Oh, and obviously, because you’re all our friends (on Facebook) you’re all invited to the party! We’ll be hosting it in every Warhammer and Games Workshop store in the world on the 16th of April alongside loads of promotions, games, activities and the release of a very special miniature." "The first miniature off the production line, after Citadel Miniatures relocated to this site in 1997." Note that I'm not making any claims here about the nature of the anniversary model. It most assuredly will not be this model as I personally reckon it will be a Mk.6 marine (i.e. beaky!). A short update on the Tartaror terminators today. This is one that I created very quickly whilst I had some pliable green stuff on hand to create the waist height extension on a Tartaros terminator. I've attached the combi-plasma created earlier and appropriately green stuffed now, alongside a chain fist left arm in a pose that is reminiscent of one of the Betrayal at Calth terminators. I like the pose, but clearly I've still got to trim the flash away from the legs yet! (I was in a rush…). I will also be adding some pouches on to the model to fit in with my other terminators. With the Warp pulsating through them like blood, these creatures have been extensively mutated by exposure its powers. Some of these mutations are unintentional, but there are those that try to actively bring it on themselves via dark ritual. For me personally, I really like the conversion opportunity that the Mutant Spawn offers. Sure, they could be represented by miniatures such as the plague ogryn range, or even chaos spawn, by for modellers and converters, the possibilities are wide. In game, they gain a slew of special rules including both fear and fearless. I cannot underscore enough what these rules are doing. In 30k, both of them are not common, and fearless in particular is very rare. When we add them in concert to a powerful stat line and other rules like "It Will Not Die", this is a unit built for close combat. There are strong negatives here, in addition to the obvious one that only armies with Tainted Flesh can take this unit. The random number of attacks will be familiar to chaos players already - and the chance of rolling a "1" for a combat will mean that they're not going to perform at their best. Their random gifts that are determined at the deployment stage are also a bit of a hit and miss affair. I would have preferred these to be purchasable upgrades myself, but the rules are what they are. Finally, the blind aggression rule is a big negative. Having to always attempt a charge, even if it is vastly improbably (12 inches or something!) means that there could well be a whole lot of overwatch shots going their way. Positioning -- even right from the start -- is important. If infiltration is possible, then this unit is one to consider infiltrating or outflanking with. Arguably the best way to turn these negatives to an advantage is to think of the unit as a "distraction" unit that needs to be dealt with if the opponent wants to progress. With only extra models to be added here, the only choice is to select how many models you want in the squad. A minimum choice (of three) is sound and cheap enough to cause a solid distraction. But as with many things in 30k, I would think that one would want to go slightly bigger than the base size. Five or six seems about right if the points are available. I have recently found myself returning to the concept of crystal growths and stacks to create terrain features out of. I originally created a small selection of crystal stacks a few years ago as a bit of a curio -- something that isn't seen on many gaming tables. With my purchase of a Frost Grave gaming mat, I returned to the concept and set to work on creating a few more (rather than purchasing crystal grows from GF9). Unlike using superglue, this time I turned to a glue gun and loaded up on the cylindrical glue to create this one. I like the glue gun for this -- it certainly holds well enough and is broadly a bit cheaper than using supergule (which I will now save for plastic marines!). That said, I do think that certain brands of superglue hold better than the glue gun gunk does. But it doesn't matter particularly. The gunk out of the glue gun looks realistic enough and seems like a genuine part of the scenery piece. Email in: Mono-Tzeentch Daemons please! One of my old gaming mates from Down Under recently messaged me. He wants to start a brand new army (1850 points). He's done Eldar and Dark Angels and wants something that is a bit more horde-y. Although Orks did cross his mind, he has decided to start a mono-Tzeentch chaos daemons army. He's also keen to play something that doesn't focus 100% on daemon summoning. Which is understandable. So, he sent me this following army list for comments. He's also perfectly happy for me to post it here and gather any feedback from Warpstone Flux readers. There are some constraints here though. He *wants* to play a soul grinder. Just because. So don't question it. Beyond that, almost anything is up for criticism. (1) Take instruments of chaos, even dropping icons to do so. 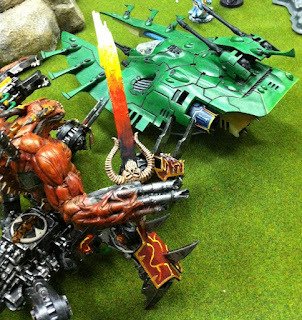 (2) Bigger screamer units, even at the expense of the daemon prince. (3) Exalted locus of conjuration on at least the heralds would be terrific here. (4) Not sure about the relic. Further comments most welcome -- can you help an old friend of mine defeat his enemies whilst remaining plausibly fluffy and avoiding full-on mass summoning as a tactic? The observant amongst my readers may have noticed that we've been using something new recently for our games and some of our photos. I recently invested in a gaming mat purchased from Deep Cut Studio. The image shows the purchase: a 6 ft x 4 ft mat in the Frost Grave style. Due to the height I took the image at, the resolution is not perfect, but rest assured that the detail in the gaming mat is simply amazing. In terms of construction, the mat that I got is a "mouse mat" style. This means that image is printed on a linen upper surface whilst the lower surface is effectively a large rubberised anti-slip mat. The thickness is around a few millimetres and the weight a couple of kilograms. We've already used the mat for gaming on in our local group and we are very pleased with the results. Not only does the mat stay in place, but the surface is an excellent finish. It doesn't fade and is nicely scratch resistant. Moreover, rolling die on the surface doesn't make such a huge clanging noise as one would expect otherwise -- its a muffled or muted clatter as they hit the surface. This makes a subtle but very nice difference to our games. It also makes picking up the die a lot easier than on a flat wooden surface if I'm totally honest as well. The level of detail is simply tremendous. The picture reveals multiple areas of the map that are frozen and can be seen underneath other "layers". It has clearly been proceeded with a high degree of care on a computer generated image and reproduced superlatively well by the printers at very high DPI. There's plenty of interesting features that can be used as a staging area for terrain pieces, or even potentially harbouring a subtle cover save in some places. Overall, despite the cost and the transit time of a week, I am very pleased with this purchase. We will certainly be using it way in to the future! Having tested out some techniques on one missile launcher heavy support squad member, I've expanded the base coat layering to all of the models in the squad now. Overall, I like how they're looking, but I need to think hard about how to highlight them and bring them up to an interesting azimuthal colour. Comments welcome! Whilst this is at least a few hours old now and has already been reported elsewhere, I'm covering it here as well since its such a BIG THING. 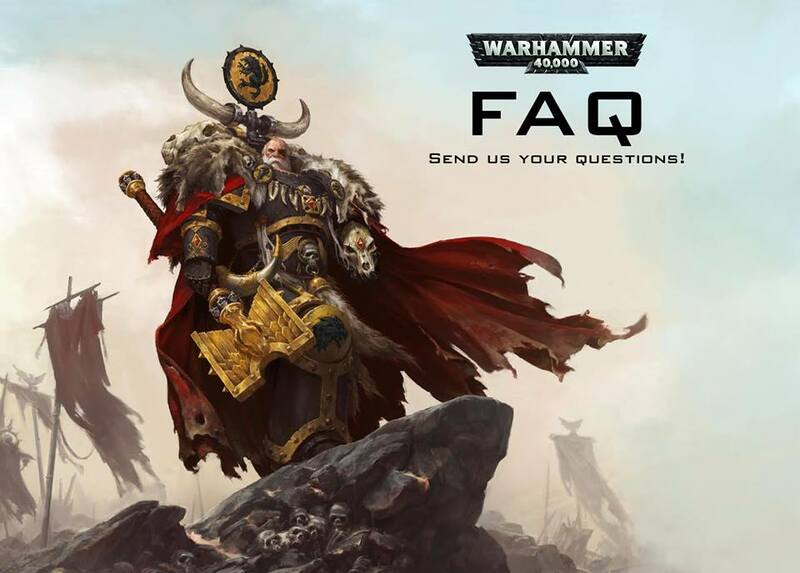 Games Workshop is asking the fan base for what questions they would like answered. This is amazing. If you're like me and have been playing since the heady days of Rogue Trader, you would have seen the rise, fall, rise, fall, rise cycle of the company and the Game, plus all the codexes. 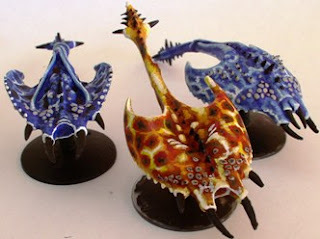 Indeed, if you look back through my posts, you'll see I was playing Chaos Daemons before they were a top tier codex. And when they were. And when they're just competitive. And so forth. A similar cycle has happened with Games Workshop's engagement with the community. Long ago, they did have things like discussion forums and engagement via Facebook (etc.). But all this was put on ice a long time ago. Recently, both GW and FW came back to Facebook with vigour. What we're seeing is really good to be honest. Gargantuan Creatures - can they shoot all of their weapons at different targets, or can they only shoot two different weapons at two different targets? How does a Gargantuan Creature Move Through Difficult Terrain? A) A psyker can only cast as many powers as he has mastery levels. E.g. ML 1 can only cast one power/use force weapon once. B) Can cast as long as there are still warp charges left and they are not casting the same thing again. E.g. ML 1 could cast a power, and then use force weapon. Are warp spiders intended to be allowed to jump away every time they are shot at or just once a shooting phase? Walking around with the family today hunting for dresses, my wife pointed out what was in the window of Oxfam. A lot of Horus Heresy novels no less! At GBP 3.50 each, I bought these pair, as well as a several books for the rest of the family. A bargain! And helping charities at the same time! The morale of this tale is to keep your eyes open. There's often lots of things around the place that are cheap, or could be turned to enhance the hobby. Buttons and cork being just two examples from yesteryear. Just a short post today on some painting that I've been undertaking for the Alpha Legion forces that I'm creating. Following in the footsteps of my recon sniper marines, today I wanted to show an intermediate step in painting some of my heavy support squad. Here, I've completed the base coat and the initial layering with dark washes and recess work. I now need to proceed to lightening the edges and doing the general highlight work. I might do the edging in some light blue, but silver is tempting as well. Not quite sure which way I'll go yet. I've also been experimenting a little bit with heat staining on the tip of the missile launcher. It needs a bit more blending, but its getting there. Regardless, overall I'm happy with this intermediate step and there's clearly more work yet to do here. If one is facing a "big bad" in close combat that a unit cannot hurt (e.g. a soul grinder that is fully mobile and AV=13 front armour with nothing but S=4 attacks), then it is possible to voluntarily fail a morale check to get out of that combat and not get bogged down and generally tar pitted until death. Here endeth the note to self. One of the problems with miniatures produced and available only through official conventions is that they're rare. A corresponding issue is that when they appear on e-Bay, they are invariably incredibly expensive to purchase. Autilon Skorr is one such example of this type of issue. I really like the rules associated with the miniature and wanted to run it in one of my 30k Alpha Legion army lists. So, without wanting to expend a vast amount of cash on an e-Bay purchase for the miniature, I decided to create my own. One of the features of Autilon Skorr is the power axe. For this, I followed my terminator conversion and attached a chaos space marine terminator axe to a space marine commander chainsword arm -- the one with the angled wrist. For the other arm, I decided against the command rod style of implement, and went for a power dagger in an inverse grip (essentially a grey knights power weapon that has been trimmed down to a shooter length). Shoulder pads are the Alpha Legion specific icon and the legion centurion, whilst the torso and backpack comes from the space marine range. Legs are extended for a true scale marine (see the green stuff in the thighs), and the helmet is a cut down chaos warriors one. Since Skorr comes with a lion-esque helm for the original miniature, I wanted one here that was suitably intimidating, and thought the chaos warrior range was not a bad idea for this … and perhaps foreshadowing the Alpha's fall to chaos (or at least, some of them at any rate -- because goodness knows how many of them are loyal, traitor, or anything in-between). The base topper comes from Anvil Industry for the curious. And that's about it! What do you get if you have a big weapon mounted on a basilisk or a medusa, and you remove the tank treads? You get this: an immobile ordnance battery. Placed in strategic locations, they can certainly prove their worth with some big guns and nice survivability if treated well. The ability to take an Earthshaker cannon or Medusa siege gun at a reduced cost compared to the tank treaded version is certainly a strong temptation for a big-guns style of play. And its one that would certainly appeal to me, if I were a strong Auxilia or Cults player. Both the Earthshaker and Medusa are strong weapons with the barrage rule and a big pie plate to cover a large area. The breacher shells that are available as an upgrade impose a S10 AP1 hit over a smaller area that can dominate the battlefield in the right conditions. Clearly these things are immobile. And more crew would be a wise investment here as well. The four crew are going to die very quickly if they come under sustained fire to be honest. On the other hand, the siege weapon itself is rather survivable with T=7 and multiple wounds coupled with a save that actually exists! 3 Artillery carriages (Earthshaker) (225 points). Subtle this is not. I hope that it'll get off at least 2 rounds of firing before the crew come in for a bit of attention. 3 Medusa with Breacher Shells, 8 crew each (351 points). High strength and capable of putting a dent even in a superheavy. This is a set of weapons that should be looking to take out a tank every turn and survive multiple turns in to the game. The more baseline variant of the above. The Leman Russ was arguably relatively new at the time of the Heresy. Horus has the foresight to ensure that those he thought would declare for him had plenty of them as well. In the Heresy era, they're deployed in number -- up to three tanks per heavy support slot. On Warpstone Flux, we have covered Leman Russ tanks several times before. When we looked at the Solar Auxilia, we had both the Leman Russ Assault Squadron and the Leman Russ Strike Squadron. Between these, we have already covered the main variants. In this army list for the Imperial Militia and Cults, we can take a combination of the basic Battle Tank, the Annihilator, the Exterminator, the Demolisher, and the Vanquisher. Unlike our previous reviews, these tanks don't come supercharged. They do not necessarily infiltrate, outflank or move fast. They're basic. No armoured ceramite either for that matter. Equally, they're still Leman Russ tanks and they're the right price for what they can do. I've taken these builds from the previous ones we've looked at here on this blog but removed things that aren't available elsewhere. They're functional and effective. I'd recommend taking 3 of the same if you're going for multiple to ensure that the range and function of the weapons is the same. In this epic diorama at Warhammer World, we see a large ensemble of Tyranid organisms invading an Eldar protected planet. There's so much to this diorama that its tough to talk through it all. In no particular order, I really liked the glowing yellow / red of the lava, the flying tyranid and Eldar battles in the skies, the drop pods from the hive mind, the Eldar war machines and titans marching to war and the way that the smaller organisms are cautiously winding along the narrow ledges to avoid falling in to the lava itself! Take a look and see what you can observe amongst all this goodness! In today's post, we're going to go a little bit off the usual fare of Warhammer, painting, and roleplaying games, and talk a bit about the board game of Go. In the world of Artificial Intelligence, the game of Go occupies a high position. This is because unlike other games (Chess, Draughts / Checkers), there are a huge number of potential plays (legal moves) and possible board positions. What does huge mean in this context? Well, in Chess the typical number of legal moves per board position is about 35 and the depth of the game (the sheer number of turns required to complete a game) is about 85. This compares to values of 250 and 150 (respectively) for Go (Silver et al., 2015, Nature, 529, 484). In turn, this means that it is a practical impossibility to "crack" the game of Go in the same way that Draughts / Checkers has been solved: by exploring every possible board position and finding the optimal strategy through brute force. Chess and Go, although not solved in this manner per se, can be helped by reducing the search tree of both the breadth and depth of the possible moves to those that are more likely to help. This worked spectacularly well for games of Deep Blue against G. Kasparov (Chess Grandmaster at the time). But Go seemed out of reach. Until the past few days. Enter Google and the DeepMind team who created AlphaGo. By using both policy networks (move selections) and value networks (is this particular board position / predicted board position any good for me? ), coupled with supervised learning and reinforced learning, AlphaGo has now (at the time of writing) beat one of the 9-Dan rank champions of Go twice, Lee Sedol. There are 3 games remaining in the series. To put it in perspective, there are more possible Go positions than there are atoms in the Universe. Despite really simple rules, Go is a highly complex game that few ever master. What this means is that to defeat a Go grandmaster, a computer must start thinking like a human. It must discard what it thinks are bad moves and think only about ones that will prove productive for it. In other words, it needs what can be described as "intuition" to play effectively. A gut instinct that a given play will lead to a better outcome. That's the level of AI we're talking about here. All this said, something else really struck me whilst I was watching the live broadcasts of these games. And that is the way the commentators are talking. They are talking as if the AlphaGo program is a human player. At certain (rare) junctures, they comment that "this move is weak" or "that move is unexpected" about AlphaGo's plays. I didn't think much of these comments at the start (why should I? - they know much better than I do about "good plays" in Go). Until this morning. When they interviewed one of the programmers. What was very striking about this interview was how they crafted the program. Rather than taking a purely human approach of building up a sizeable lead, or generating a "comfortable margin" (for lack of better words) in terms of the game's points, all the program seeks to do is win. The nature of the win - by a single point, or by many - is not relevant in the slightest. Therefore, if it comes across a move that might seem "weak" to a human player, it must be borne in mind that what it has done is optimised the probability of winning. Put another way: it could make a "strong" move and optimise the number of points it wins by but have a lower probability of winning, or it could make a "weak" move to optimise the probability of winning overall. What this means is that the computer is not playing like a human. It plays to win. But it doesn't care if it wins by 1 point, or by 100 points. All that matters is that a win is secured. Therefore, apparently sub-optimal plays (as judged by not building a comfy margin) are actually optimising the winning probability. It is this that I found truly profound. I then got wondering about 2 things. (2) And can we (and do we actually already) apply this principle to other games -- even games that involve elements of chance like Warhammer 40,000? I'll be watching the next few games with interest and pondering if Lee can come up with some magic to defeat the intuitive program somehow - especially if he finds a way to exploit its own methods against it. Arguably the lightest of the walker class of vehicles, the Sentinel was used on both sides of the Heresy to varying degrees, and more by planetary governors to keep the unruly citizens in line and obedient. (and suppressing them when rebellion did occur). They're really rather cheap overall. And that, in a nut shell, is their primary strength. Okay, they've also got move through cover and scout to make them mobile which is certainly an attractive bonus (based on how the board might plausibly be set up). Their configurability is good and they can pack a punch if they're ignored too long on the playing field. Imperial Guard players will be accustomed to their drawbacks. The AV=10 armour combined with being open topped and low hull points mean that they are very easy to remove from the board. Indeed, even bolter shots can glance an entire squad of these to death in good time. Not so sure that the combat blades are a worthwhile upgrade, but hey, we might as well explore the idea. They're cheap enough, so why not spend some points on them. Here's a few ideas. 3 sentinels, additional combat blades, heavy flamers (105 points). Find a way to get them close (e.g., Master of Ambush) and they're probably going to be a great tar pit for a round or two. I hope. 3 Sentinels, heavy flamers (90 points). A distraction unit to be deployed against units in cover. Take your chances and see if you can kill them? 6 sentinels, lascannons (240 points). So long as you have first turn, you should be able to put these to at least some reasonable use. Switch to missile launchers by the same logic if preferred (for less points). 6 sentinels, autocannons (210 points). Lots of firepower should be able to do something before you get blown away. There really is something about Ogryns that appeals to me: mutated abhuman giants of men that have been either created or native to high-g worlds. Imported for labour, and to the army to do some brutal work, their strength and durability is superior to an Astartes. Its just a pity that they cannot be implanted with the Astartes genes really. Or can they? Perhaps that's a thought for a different day (e.g., can you imagine an Ogryn teen being implanted with Angron's gene seed? What about Fulgrim's? Okay, I'd better drop this and get on with the review). Great strength and toughness, combined with triple wounds make these brutes a force to be reckoned with on the table top -- especially in close combat. The real challenge here is to think how to kit them out without paying too much in terms of points. The rather low leadership is a cause for concern here. You're going to need some way of dealing with this (e.g., discipline collars or similar). And the low ballistic skill means that we probably want to keep the Ogryns focussed on close combat rather than ranged shooting … regardless of how tempting it might be to have a heavy bolter being treated as assault 3 in their hands. The other problem is how to get them in position for an assault. They don't have access to a dedicated transport, so one will need to be specifically bought for them -- and they're classed as very bulky. Its tough to decide what to do with them in this regard. 3 Ogryns, power axes (180 points). The power axes are to give a low AP for their comparatively high strength attacks. I'd suggest trying to roll Master of Ambush for the warlord trait (or similar) to get these guys in to position. They're a distraction, and a pest if ignored that can cause significant damage. This is a pure meat shield squad. Find a way to keep them from routing and have them soak up any wounds and give cover to others behind them. I actually wouldn't run this build, but am just including it for laughs. 5 Ogryns, 2 heavy bolters, 1 lascutter, Carapace Armour (255 points). A balanced squad with multiple threats at both range and in close combat. Locally trained and responsible for the warriors under their care, as opposed to the proper Imperial Army, these men and women look after the troops and patch them up as best they can. As with their legion counterparts, these orderlies can be assigned to specific squads within the army and are bought as elites to the army. In doing so, they bring the feel no pain rule to that unit at 5+. That's really all there is to these troops. They're mortals with a mortally poor stat line and baseline equipment. At least they're cheap enough that each squad that needs to have one should be able to purchase one. Assuming you have enough elites slots to spare in the force organisation chart. There's little reason not to take them overall, so long as there's slot space and they tie in to the army well. There are no builds here to mention. The only upgrade possible is to take more of the Medicae Orderlies. Today, I'm going to continue a trend that we started on Warpstone Flux with the release of Betrayal at Calth. We're going to see if we can build an army list for Horus Heresy 30k from the components contained inside the Deathwatch Overkill board game! Given there there are so few marines, and that they already come with data sheets to cover their use, I wanted to specifically focus on the Genestealer faction. Arguably the optimum faction to represent the Genestealer Cult in 30k is the Imperialis Militia and Cults army list presented in Horus Heresy Book V: Tempest. Although the Solar Auxilia could be used, I think the Cults army is designed for this kind of force. From this, we're not going to make a high points level force, but let's see what we can do. Firstly, we want a Force Commander. To characterise our force, we want to take some Provenances that will resonate with the Genestealer Cult. I think for this, I cannot go past Abhuman Helots (which provides a bonus to toughness, at the expense of initiative) and Tainted Flesh (to provide fear, feel no pain, as well as access to Mutant Spawn -- these will be the Aberrants). The only problem here is the Tainted Flesh. Although I really want to get Mutant Spawn, the fact that we would have to take heaps of Inducted Levy squads makes this a non-starter if we only have one lot of the Deathwatch Overkill Genestealers. Equally, I also want access to Rogue Psykers so we can use the Magus. That means we have to take either Cult Horde or Tainted Flesh. So, we're effectively stuck with one of these. Of these two, Tainted Flesh seems a lot more appropriate, so we will live with this one. We will represent the Force Commander with the Genestealer Patriarch. Its either him, or the Primus to be honest. We can use the Primus as a squad commander instead, and then take some other squads. Either way, we are looking at buying additional squads from Cadians (or similar) regardless. The only way around this would be to take an army that's just got Abhuman Helots and therein take Grenadiers. 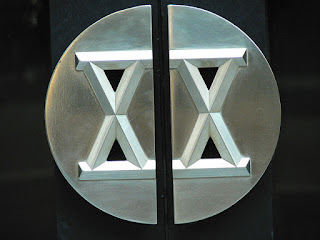 We'll look at the separately in the second half of this post. Force Commander, power weapon (replacing pistol), infra-visor, carapace armour, iron halo, planetary overlord rule; Provenances: Abhuman Helots plus Tainted Flesh (175 points). The options here have been selected to represent the patriarch. They're all "counts as" in this context rather than WYSIWYG. Rogue Psyker, Alpha Psyker (60 points). This one will represent the Magus. Inducted Level Squad, lascarbines, discipline collars, frag grenades, vexilla, Custodian with hand flamer (90 points). Sadly, this squad is 20 strong. It will therefore fill up with the vast majority of the hybrids. And we need yet another one of these squads to meet the minimum number of troops. We will need to purchase at least 12 other squad members to complete this squad (8 hybrids, plus maybe a box of cadians, the Primus could be thrown in here as the Custodian to take the number down again, and possible the familiars as well?). One squad of 3 spawn. Perhaps this is 2 aberrants plus 1 purestrain? Another purestrain plus 2 aberrants! Obviously we could put these two squads together, but there's no reason to do that. TOTAL COST = 585 points. Suitable for an ally perhaps, but little else in 30k! Force Commander, power weapon (replacing pistol), infra-visor, carapace armour, iron halo, planetary overlord rule; Provenances: Abhuman Helots (140 points). Again, this will be represented by the Patriarch. Platoon Command Cadre, Commander with Melta Bombs, Refractor Field, Plasma Pistol, Bodyguards with close combat weapons, 1 extra body guard all with carapace armour (65 points). These squad members will be represented by the Primus (Commander), Magus (Vox or Standard Bearer); A hybrid as the other out of the Vox or Standard bearer; Purestrains and Familiars as Body Guards. These will be represented by the Hybrids and Aberrants. One of these 3 squads will take an extra member, for an extra 5 points, making for a total of 440 points. TOTAL COST = 645 points. These two army lists are just suggestions of course. And they need a lot of "Counts As" permissions. But I kind of like them. They're not uber effective, so don't expect to win games or tournaments with them. Just enjoy them for what they are: a way to represent Genestealer cults on the battlefields of the Great Crusade potentially! Locally, we are going to be having a round robin style tournament in the coming weeks. I've decided to field a 30k Pre-Heresy Alpha Legion force for said tournament. My main goals are just to get a feeling for how it plays, rather than wanting a "winning" list that will crush all opposition. Indeed, one of the participants in the tournament will be a new-comer to the game. Hence I really didn't want to alienate them by taking a Death Star army, or Leaf Blower, or any other combination that is really overly hideous to play against. In short: I don't want to be "that guy" since the tournament is a friendly one (with no prizes other than bragging rights), and I want the new-comer to remain! We agreed that the points limit would be 1000. This is an interesting points level for a number of reasons. Most obviously it really restricts what you can do with building an army. Particularly in 30k. Indeed, I feel I will be at a distinct disadvantage compared to the participants who will be playing 40k codex armies. Hence I don't expect to win. But that's okay. With all of that in mind, I decided that I would build a force around Autilon Skorr. Although I do not have the miniature for Skorr, I can readily create one from a scratch build. But what I like about Skorr is his ability to select his warlord trait. I'm therefore going to opt for Infiltration of 3 units with Skorr. On top of that, I will then use the Alpha Legion mutable tactics as either Scouts (to get closer) or Tank Hunters depending on the army. Realistically, Adamantium Will might also be an option too. So I'll keep those options open until I see the opposition. Speaking of the opposition, its likely I will be facing at least Chaos Daemons (probably a mixture of 2 or more patron powers); Chaos Space Marines (probably Nurgle based) and Eldar (craft world … probably a mixture of forces with a danger of seeing Eldrad). Hence: all options are being kept open here. To build the list, I then thought about which Rite of War I wanted to take. Although I did consider taking Skorr's Delagatus Rite, I eventually opted for taking Pride of the Legion. The main reason for this is that I really just wanted to use my terminators! Plus, they're assembled and painted, unlike some other components I have planned. *Autilon Skorr (125 points). Rite of War = Pride of the Legion (i.e. terminators and veterans are troops, as below). I think it should be obvious what I'm up to here. I'm aiming for an Alpha strike (pun not intended) through getting my marines up close and personal with the enemy as soon as possible in the game. Skorr will deploy with either the Veterans or the Terminators. I'm likely to give Fearless to the veterans for a few of the match ups, but could see other options there too. They will target either transports or big blobs of enemy troops early on, before charging in. The terminators will have a similar role, but be more focussed on anti-infantry compared to the veterans. The Master of Signals will be deployed with the heavy support squad for bonus BS. They will sit back and reach out to destroy vehicles, etc. Hopefully the big pie plate from the Master of Signals will happen in the first turn or two as well to take care of another big blob of troops. The Recon squad is there to do some target practise. I'm hoping to get a few precision shots off to take care of enemy characters, or even exploit AV=10 armour in a few places. The weaknesses of this list are painfully obvious though. I've decided to not play any fast attack choices (I was toying with an assault squad, but could not justify the cost at this points level; I toyed with bikes as well, but wanted terminators more … and the bikes were not assembled in a big enough squad yet either). Fliers are going to be a pain as well, so I'm hoping I don't see too many of them. And obviously, I've foregone dedicated transportation to ensure that I can conduct a strong Alpha Strike with the infiltrate / scouts combination. I'm really worried about playing against the Codex: Daemons player as well. But being a daemons player myself, I guess that I just know what to expect! I know I'm not going to win many rounds here. But that's not the point. I want to see how it plays and how I might alter it later on. Its been a busy week hobby wise for me as I get my Alpha Legion force built for an upcoming round-robin tournament with some friends. Whilst I don't expect to do very well since I've not particularly optimised my army list (I'm introducing a new person to the game, so I don't want to be "that guy" unless they decide to get more serious), I do want a reasonably assembled force. And perhaps undercoated to. To that end, here is a squad sergeant conversion that I wanted to share. What makes this marine stand out and "pop" on the table top is his "power fist" that features a circular saw. The circular saw is a "Destroyer Arm" sourced from Puppetswar - a Polish company. Although I originally intended that they would just be fancy close combat weapons, they do look good when they "count as" power fists as well. And although they would look fairly standard and not need any conversion knife work on a terminator, they work equally well on a power armour miniature. All that is really needed is to trim the shoulder so that a standard space marine power armour shoulder pad can be glued over the top of it. Which is exactly what I've done here. The other parts are mostly Forge World (torso, legs -- green stuffed to true scale, right shoulder pad), space marines (left shoulder pad, bolt pistol arm, head) and chaos space marines (back pack -- Anvilus pattern). On the 32mm base, I've attached a base topper from Anvil Industry. I like the look and pose of this one. His left arm is fluidly in action, swiping out an arc of death. The bolt pistol meanwhile held in reserve for the correct moment. I better get some painting underway soon. The legs of the Warhound Titan, Novacula Occulta, continue to grow upwards! Here, I've basically completed the main parts for one of the legs. The other leg is not too far away from being complete either. I've pinned each of the joints using a brass rod through the sides of the joint. Depending on the final weight of the Warhound, I may add another brass pin at a different angle through each of the joints as well to ensure it is better supported and unlikely to move or break. In all of this, the most fiddly bits have to be the pistons. They can be seen here around the ankle of the leg -- connected to the foot and the lower part of the leg. Not only do they have to be trimmed to the correct length, but getting them looking right resulted in many glued finger tips. My advice here is to just take your time and enjoy the journey. No need to rush things! I also dry-fitted the front plate of the lower leg to ensure that it fits nicely over the upward bent toes -- and to my relief it does. The Garden of Moor house at the bottom really communicates the sense of scale for this titan. She is really growing taller now! It has been a while since I updated my progress on my Warhound Titan. The delay was largely due to family, as well as tools having an inconvenient way of breaking whenever I want to use them. Clearly I need to shout more incantations to the machine god before proceeding with this endeavour. I've now built both of the feet of the Warhound, as displayed in the image below. Perhaps the most fiddly bits are the pistons -- I'd certainly advise to always measure twice and cut once with these bits -- although it is nice that you get spares of these. The second image shows that I've even made some progress beyond the feet. The first joint of the legs are now in place as well. This took some drilling to accomplish. In short, I've inserted a good length of brass rod straight up through the base of the foot and up in to the ball and socket joint to ensure that this leg is sturdy. Add in some glue, and a scratched surface for the glue to adhere better to, and its a bond that won't be moving any time soon. As some readers may have read, I've also named the Titan. It shall be known as: Novacula Occulta. (the link goes to The Titan Owners club webpage). This roughly translates from the pseudo-latin to English as the Hidden Razor. Progress can be followed on Warpstone Flux through the Perennia tag. Speaking of which: this Titan will belong to the Legio Perennia. This is a titan legion that the Alpha Legion stole (see the Black Library short story The Harrowing for details) and will therefore be an excellent complement to the Alpha Legion foot soldiers that I'm currently building. Naturally, the Princeps of this war machine will be called Alpharius. Who else?! The Demi Legion will be Gyra Caerula -- roughly translating as the Blue Wheel or the Rotating Storm. The inference here is that its wheels-within-wheels (or complicated plots!). Also very suitable for the Alpha Legion's allies.